Johnny: You guys need to get a clue. 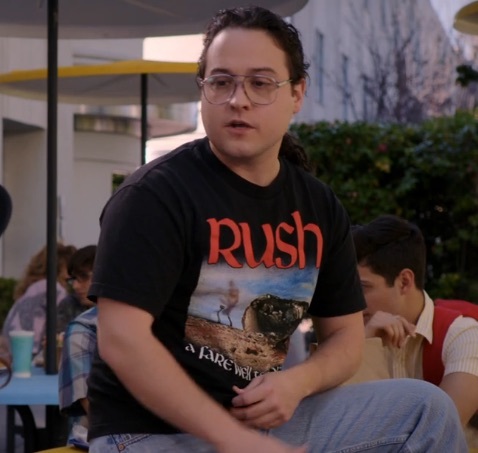 There's only one band on the planet that matters - Rush. They're not the canned garbage you listen to. They're real. They're from Canada. It's super cold so they have to rock super hard to stay warm. 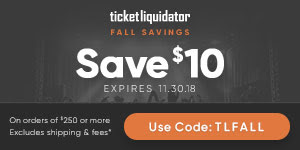 Erica: I'll take your word for it. Johnny: Why take my word for it when you can come to my Corolla and find out for yourself. Unless you're afraid. Erica: Of being alone with you in your rusted out piece of crap? For sure. Johnny: Hey - Johnny Atkins respects women. He has bad hair days too. Not many though (flips his ponytail). The next scene is the one shown in the preview clip below. 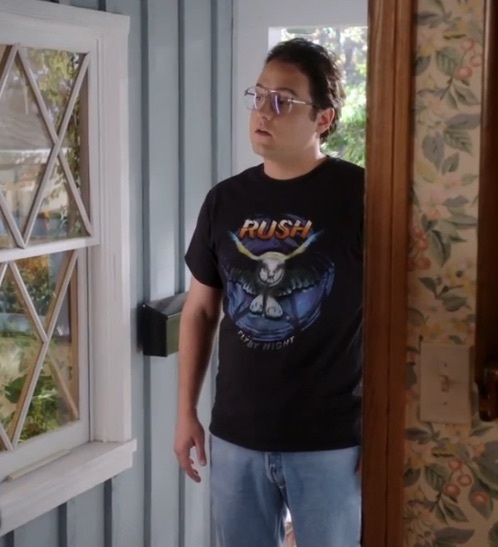 From that point on Erica becomes a Rush fan, wearing Rush t-shirts (she wears multiple Rush shirts including this Caress of Steel shirt), decorating her room with Rush posters and a lifesize cut-out of Geddy Lee, and also buying Rush albums (they show the Caress of Steel album). 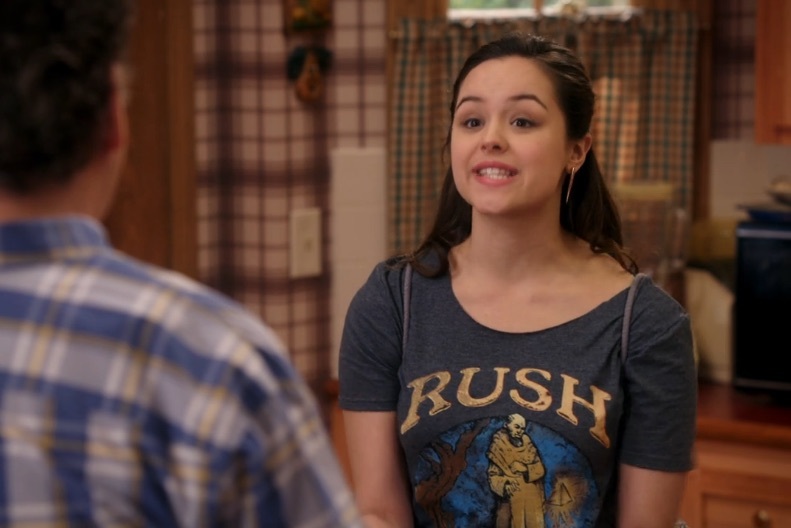 She starts dating Johnny, much to the chagrin of her father, and also joins Johnny's Rush cover band - Speedup. Later in the episode she has a falling out with Johnny and he kicks her out of the band. She then plays Tom Sawyer for her two friends, turning them into Rush fans as well. They form their own Rush cover band and enter the battle of the bands competition themselves, and wow the crowd with their Tom Sawyer cover. 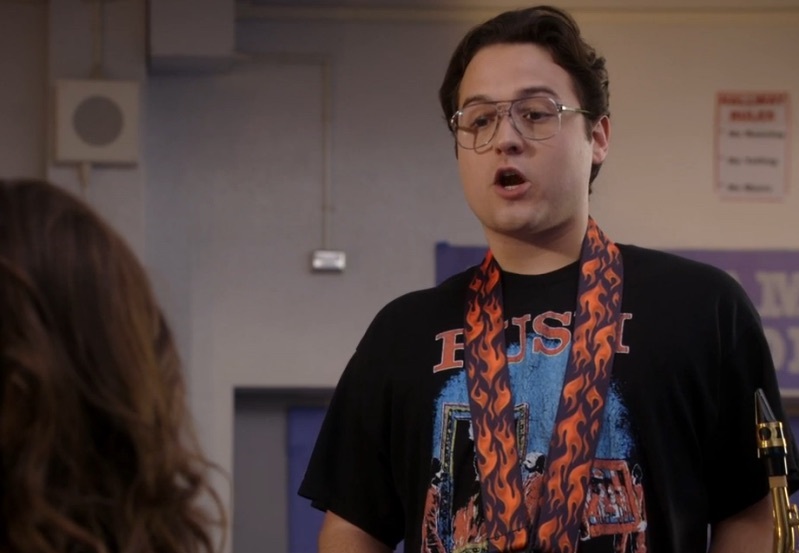 When Beverly gives Adam a "best son" trophy, Barry brings to her attention that she always favors Adam. Appalled, Beverly decides to ignore Adam (much to his delight) and smother Barry (much to his dislike), but it backfires. 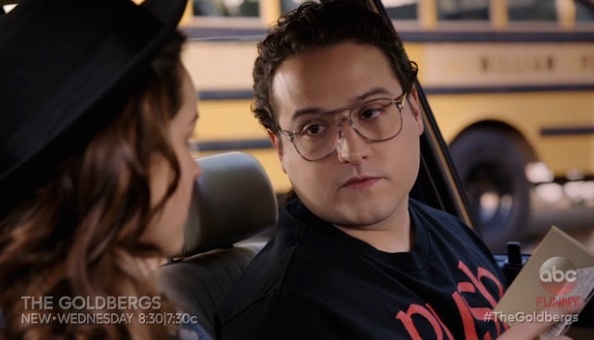 Meanwhile, Erica starts dating a boy who gets her to love the band Rush as much as he does and whom Murray doesn't approve of, on "The Goldbergs," WEDNESDAY, APRIL 13 (8:30-9:00 p.m. EDT) on the ABC Television Network. Johnny: Are you ready to step into the musical cocoon and emerge a rock-n-roll butterfly? Erica: Just play it so I can be proven right. In that moment my sister's mind unlocked as she was ushered into a world of prog-rock. It was an instant attraction in more ways than one. Johnny and Erica then start making out. You can watch the clip below or online at this location. 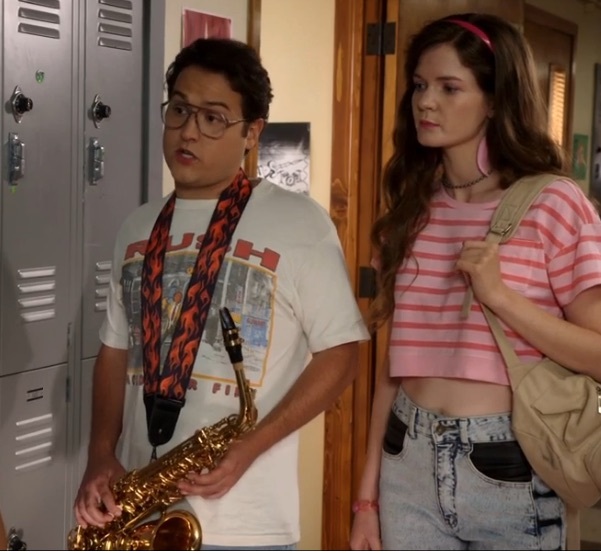 The episode airs tonight, April 13th and you can watch The Goldbergs on ABC or online at the ABC website here.